The Congress-led UPA is likely to win only 134 seats while others are expected to win 139 seats, as per the opinion poll. This time, several opposition parties are trying to come under one roof, in their attempt to dethrone the BJP at the Centre. The NDA is likely get a combined vote share of 34 per cent – 4.5 per cent less than what it got in 2014 Lok Sabha elections. 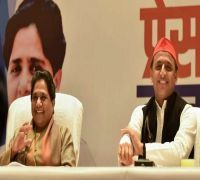 The alliance between Samajwadi Party, Bahujan Samaj Party and RLD is expected to dent the BJP’s sentiments in Uttar Pradesh. 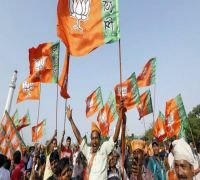 The BJP-led NDA government is likely to retain power at the Centre, riding the "Modi wave", and is expected to win 270 of the 543 seats in the highly anticipated Lok Sabha elections, according to opinion poll conducted by News Nation on Monday. On the other hand, the Congress, despite being buoyant after the victories in Assembly polls in Rajasthan, Madhya Pradesh and Chhattisgarh, will be able to win only 134 seats (with its partners) while others are expected to win 139 seats. However, according to the opinion poll, the NDA will get a combined vote share of 34 per cent – 4.5 per cent less than what it got in 2014 Lok Sabha elections. The UPA is expected to get a vote share of 28 per cent while Others may get 29 per cent of the votes. 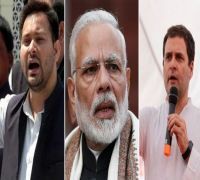 As per the opinion poll, 47 per cent of the respondents said they want Modi to continue as the prime minister while 30 per cent chose Congress chief Rahul Gandhi over the former. Also, 55 per cent of the participants said there is no match to PM Modi's stature, while 32 per cent disagreed on this. Narendra Modi had led the NDA to a sweeping victory in 2014 as it won 336 seats, reducing the incumbent Congress to its lowest total of 44 seats. The BJP had won 282 seats handing a crushing defeat to the 10-year-rule of the United Progressive Alliance led by Congress. This time, several opposition parties, despite have contrast political ideologies, are trying to come under one roof, in their attempt to dethrone the BJP at the Centre. The BJP has worked out a seat-sharing formula with some new allies and several old partners, by even making concessions in states such as Bihar, which has 40 seats. However, opposition parties are yet to do so in several states. After losing three state polls last year, the BJP believes its Lok Sabha campaign is back on track following decisions such as 10 per cent quota for the general category poor, money transfer to farmers and a populist budget. What has injected further confidence into the NDA fold is the fronting of the nationalist plank in the poll campaign after the Indian Air Force's strikes on terrorist camps in Pakistan after the Pulwama terror attack, which killed 40 CRPF personnel. The BJP has been citing 2016 surgical strikes on terror launch pads and the Balakot air strikes to assert that only a government headed by Modi will be capable of taking on Pakistan over terrorism. The alliance between Samajwadi Party, Bahujan Samaj Party and RLD is expected to dent the BJP's sentiments in Uttar Pradesh. The SP-BSP-RLD alliance is expected to win 43 seats, while the NDA may win 35 seats. The Congress is expected to win two seats. Despite losing the state to the Congress in last year's Assembly polls, the saffron party is expected to outshine the Grand Old Party in the Lok Sabha polls. According to the opinion poll, the BJP is expected to win 17 of the 25 seats while the Congress may claim victory on the remaining eight seats. In Madhya Pradesh – another Hindi heartland state which the BJP lost to the Congress last year – it is likely to win 21 of the 29 seats, while the Congress may win only 8 seats. In Chhattisgarh, the BJP-led NDA is expected to win 5 seats (41 per cent vote share) while the UPA may claim victory on 6 seats (with vote share of 42 per cent). The BJP shockingly lost the state to the Congress in 2018 assembly elections as it was former's stronghold for 15 years. In Tamil Nadu, BJP's alliance with AIADMK, PMK and DMDK is expected to win it 15 seats (38 per cent vote share). On the other hand, the UPA is likely to win 24 seats with 41 per cent vote share. In Andhra Pradesh, YS Jaganmohan Reddy’s YSRCP is likely to dominate and may win 16 of the 25 seats, while Chandrababu Naidu's TDP may claim victory on four seats. The BJP and the Congress are expected to win two and one seats respectively. After claiming a thumping victory in the Assembly polls, K Chandrashekhar Rao's TRS is likely to continue its winning run in the state. According to the opinion poll, the TRS may win 14 seats, while the BJP and the Congress are expected to win one and two seats respectively. In Karnataka, the BS Yeddyurappa-led BJP is expected to gain an edge over the Congress-JD(S) alliance. While the BJP may win 15 seats, the alliance is likely to win 13 seats. In Kerala, the UPA (Congress and UDF) is expected to win 15 of the 20 seats while the CPM-LDF alliance may win 4 seats. The BJP will win only one seat, according to the opinion poll. The BJP is expected to continue its dominance in Narendra Modi’s home state in the upcoming elections. However, the seat share may see a downfall as compared to the 2014 Lok Sabha polls when the saffron party had won on all 26 seats. According to the opinion poll, the BJP is expected to win 21 seats while the Congress may claim victory on five seats. The BJP restoring ties with the Shiv Sena is likely to benefit it in the upcoming Lok Sabha elections in Maharashtra. According to the opinion poll, the NDA is likely to win 33 seats while the Congress-NCP alliance may win only 15 seats. In Assam, the BJP is expected to win seven seats while the Congress will claim victory on four seats, as predicted by the News Nation opinion poll. In Jammu and Kashmir, the BJP is expected to win three of the six seats. The PDP, the National Conference and the Congress may win one seat each. Mamata Banerjee’s Trinamool Congress is expected to win 29 of the 42 Lok Sabha seats in West Bengal. On the other hand, the BJP, which had won only 2 seats in 2014, is likely to win nine seats this time. Here, the BJP is expected to win nine seats while Naveen Patnaik’s Biju Janata Dal may claim victory on 12 seats. The BJP-JD(U)-LJP alliance in Bihar is likely to outplay the RJD-led grand alliance in Bihar, with the former is expected to win 29 seats and the latter 10 seats. In Jharkhand, the BJP is likely to win 10 seats while the UPA may garner only 4 seats. The BJP may win four seats while the Congress may garner only one in Uttarakhand. The BJP is likely to win six out of ten Lok Sabha seats in Haryana. The Congress may win on two seats whereas the INLD and JJP will garner one seat each. The BJP is expected to clean sweep all the four seats in the state. The BJP is expected to see a downfall in its performance in the national capital as compared to the 2014 Lok Sabha elections. The saffron party is likely to win four seats while the AAP may win on remaining three seats. Both the NDA (BJP-SAD alliance) and the Congress are expected to win six seats each, while the AAP may garner one seat in Punjab. In Goa, the BJP may either win both the seats or at least one of the seats, the opinion poll has predicted. The NDA may win six of the 11 seats in the seven north-eastern states while the Congress may claim victory on four seats. The BJP is expected to win five out of six seats in UTs while the Congress may claim victory on one seat.